Today I had the privilege of meeting a woman who is the sole caretaker for nine people; seven are her children and two are her grandchildren. She lives in a village outside of Kabale, Uganda. Her husband, who was physically abusive, left her for another woman stating that he could not care for nine children; he still owns the land that she lives on. 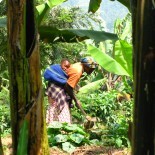 She is a subsistence farmer, however her garden does not produce enough to feed her family. When she can, she farms other people’s land, making less than $1.50 per day. When KIHEFO found her, three of the children were severely malnourished. They were admitted to KIHEFO’s nutrition rehabilitation center. Here, the children were re-nourished and their mother was taught how to create well-balanced meals and the importance of specific types of food, such as beans for protein and avocado for fat. male rabbit. A rabbit hutch is built for the beneficiary, and they are taught how to care for them, how to use their urine and droppings as natural pesticides and manure, and encouraged to eat and sell them. While rabbit beneficiaries are encouraged to eat some before beginning to sell, the rabbits do typically sell for twice what one can make in one day farming someone else’s land. Prior to being given the rabbits her family ate meat once a year, on Christmas. This scenario is very common; most people cannot afford meat, but once or twice per year. Now she says that she has meat once per month and has enough rabbits to cook two at a time. She was excited to tell us all the ways that the rabbits have helped her; she can provide meat for her family more often, she uses the money from selling the rabbits to pay for school fees and clothes, and she has noticed that her garden is more proliferative – a benefit of the rabbit droppings. There are currently over 200 direct rabbit beneficiaries and many more indirect beneficiaries. Many families who have been given rabbits by KIHEFO choose to then help their neighbors by giving them two females and one male and teaching them how to care for them. One woman we visited said that she had given rabbits to two of her neighbors (six rabbits in total) prior to eating or selling any because she first wanted to help other people. the ones to look after them. They can eat the weeds picked from the garden, making them inexpensive to feed, unlike pigs or chickens. They can also reproduce about six times per month and have on average six rabbits per litter. This quick and proliferative reproduction rate adds to their sustainability. Additionally, as mentioned before, the urine and feces can also be used as pesticides and manure for the garden. Once given the rabbits, KIHEFO workers periodically check in on the beneficiaries and can be reached if any problems arise. Those who had previously been admitted to the nutrition rehabilitation program are also reassessed monthly either in their community or at the nutrition clinic where a large nutrition assessment and education program is held. Height, weight, and MUAC (mean upper arm circumference) are measured and any malnourished or at risk children are further evaluated and recommendations given – sometimes this means being admitted or this can mean being given a protein supplement with instructions on how often to give this to the child and advising to follow up in one or two weeks. At these monthly assessments at the nutrition center there is re-education about what are the proper foods to feed a child and about preparing a well-balanced meal. The same is done when these assessments are held in the communities and occasionally a demonstration on how to build and care for raised beds and container gardens is performed. Along with another source of food and income, the rabbit project also gives hope and pride to beneficiaries who are now more capable of providing for their families. This entry was posted on March 14, 2017 by KIHEFO in Welcome from KIHEFO.